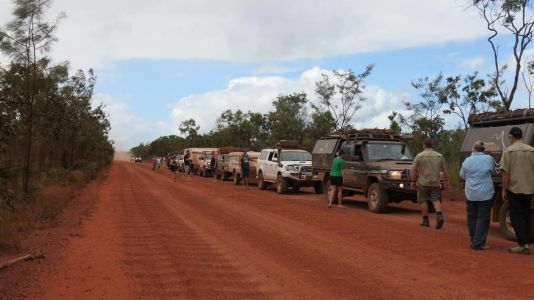 We started our push north to Cape York in mid-January. Everything was going according to plan. At Ingham we had to do a �runner� 300 to 400 kay inland (Which we�ve done many times in our 11 years on the road, to get away from cyclones) Cyclone Dylan was heading our way. 24 th January Dylan became the first cyclone to hit the coast of Eastern Queensland since Yasi in 2011. After Dylan had passed, we made our way back to the coast and continued north. 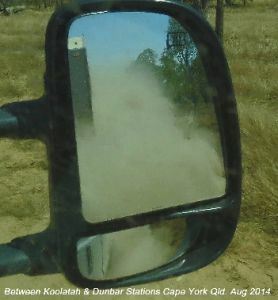 Dylan dropped a fair bit of rain in Cape York closing roads & tracks with flooding etc. Our plan was to wait it out at Mareeba until the roads up in the Cape dried out. On 2 February Cyclone Fletcher moved over the Western Gulf of Carpentaria dropping water all over the Cape. Shortly after Fletcher, Cyclone Dylan made landfall on 31 January, another cyclone had rapidly formed around 400 km northeast of Mackay. On the1st February it was given the name Edna. On 27 February, another tropical disturbance was seen and on 7 March it turned into Category 1 tropical cyclone Hadi. Hadi then weakened, before dissipating on 22 March. The Gulf of Carpentaria had another cyclone on 11 March, Tropical Cyclone Gillian. Because two cyclones, Hadi and Lusi were close to each other, Gillian started to weaken to a tropical depression on 12 March. 23 March, Gillian entered a rapid deepening phase, and eventually intensified to a Category 5 severe tropical cyclone. On 1 April, BOM reported that a tropical low had developed near the Solomon Islands. On 5 April, 16 people were killed by flash flooding from the tropical low in the Honiara area, with up to 40 people still missing. By 7 April, the death toll from the storm rose to 21. During the next several days, cyclone Ita intensified into a Category 5 Severe Tropical Cyclone as it began to curve towards the coast of Queensland. On 11 April, the storm made landfall north of Cooktown as a Category 4 cyclone. Ita then rapidly weakened and was downgraded to a Category 1 on 12 April. Ita caused over $1 billion dollars of damage after it destroyed banana and sugarcane plantations. When travelling to the Cape early in the season you need to be able to stay in a location & wait, until the roads dry out before heading north again. 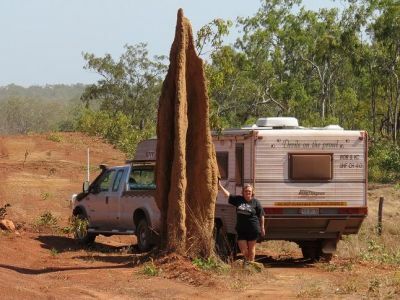 I�ve put the above information in here to show the newbies, what can happen if you�re planning a trip to Cape York early in the season. You need to be ready to �Runaway� inland 300 to 400 kays. You will get a lot of rain inland, but you won�t get the damaging winds. Now after having said that you need to monitor the BOM (Bureau Of Meteorology) web site a couple times a day to make sure these cyclones don�t change their direction at a moment�s notice. You may need to go further west, just keep an eye on it. Remember Mother Nature runs this show, not the blokes at BOM. Once up at the Cape the �Runaway� inland 300 to 400 kays can�t be done. Why get there early, No crowds & the best fishing. Back to our trip to the Cape for the second year in a row. Its now mid-May, have been in Mareeba since the end of January running away inland from cyclones to as far as Georgetown then coming back again etc. The roads in the Cape are now open and restricted to vehicles under 5 tonnes. Every creek & river crossing has water in it. 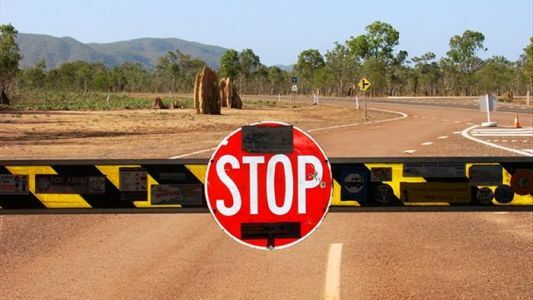 Beware, don�t hit these crossings at speed, large washed out holes lurk underneath waiting to catapult the next vehicle into the bush. We saw two results of this on our way to the Cape this year. Both vehicles were write off�s. We use Quarries as overnighters on our way up the Cape. You will find them about every 10 � 20 kays. When its time for lunch or to camp, a short drive or walk up each track will usually lead to an outa sight and outa the dust camp spot. Last year & this year, we never had any other campers come in. Not all the roadhouses have powered sites, so whats the point of paying thirty bucks when you own a BT. A nice camp is at the Moorhead River crossing. Not the dusty one close to the bridge. 200 mts north of the bridge on the right hand side. 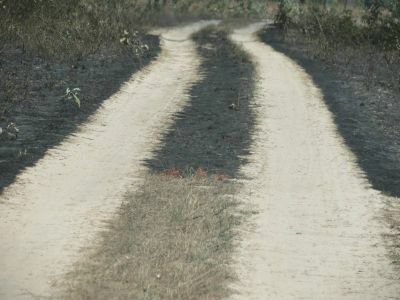 A track takes you in about 400 mts to a nice flat area, outa sight & outa the dust. 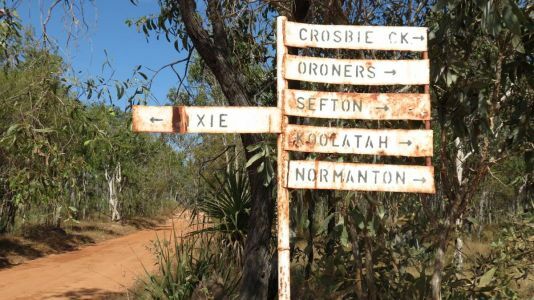 Coen is the first major town you�ll come to after leaving Mareeba. Major Town? Well not really. It has a small supermarket with the basics, a health centre, a small caf�, mechanic and a pub. If you like you�re pizzas, make sure your at the SExchange Hotel (Check the sign on the roof) on Friday nights. �Then they came back a while later and put it back up again. 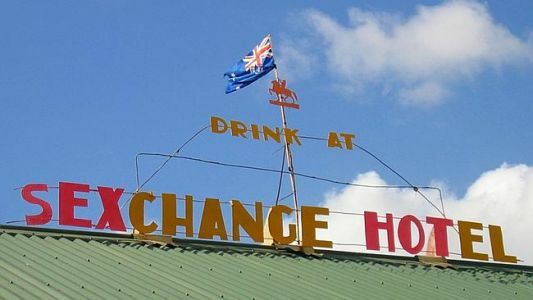 The hotel is about 100 years old and is the hub of the outback town, which has a population of a few hundred. 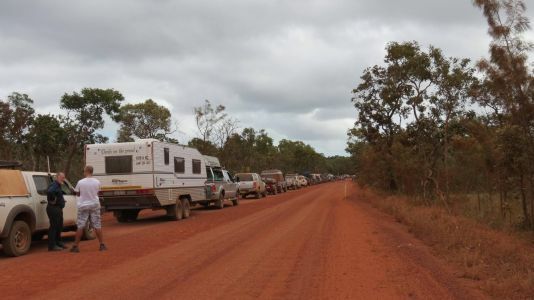 On any given night nurses, teachers, painters, truckies, ecologists, German backpackers and the odd indigenous police tracker gather to chat over a pint at the pub. Coen is also the spot to empty the crapper and take on town water. Taps & dump point on the right hand side just as you leave the main town heading north. Another kay & a bit pass the crapper point is a freebie on the right hand side called the Bend. Check Camps 7. 25 kay after Coen, is the Quarantine Check Point. They will only check you on the return trip. Stop an ask what you can�t bring back. Another 25 kay north from the Quarintine Checkpoint is the Archer River Roadhouse. 20 kay either side of Archer River Roadhouse is usually rough, with heaps of Dips, Creek & River Crossings, although later in the season these will be dry. Watch out for the white rocks sticking up out of the road surface, that some years can take a diff out if you hit one. There is a memorial here at the Roadhouse to the famous lady truck driver �Toots.� Its worth getting a copy of a book written by her daughter before heading to the cape. Toots � A Women In A Man�s World. 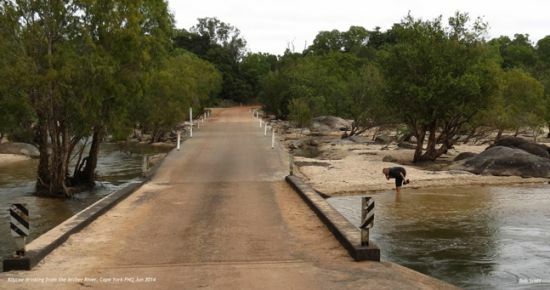 In April this year (2014) a man died when his four wheel drive was washed off the Archer River Causeway when he attempted to cross it in 1.4 mts of rushing floodwaters. 51 kays from Archer River is the turnoff to the Bamaga or Weipa. 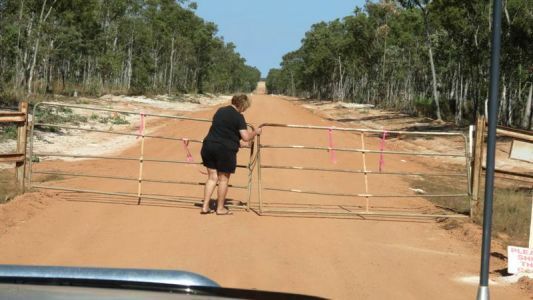 Taking the Bamaga turnoff the road narrows. Notice the threating storm clouds. Its another 72 kay to Morton Telegraph Station. 27 kay after that is the turnoff to Bramwell station, not to be confused with the Bramwell Junction Roadhouse. At Bramwell Junction Roadhouse take on as much diesel as you can. You will save around 20 cents a litre compared to Bamaga/Seisia prices. 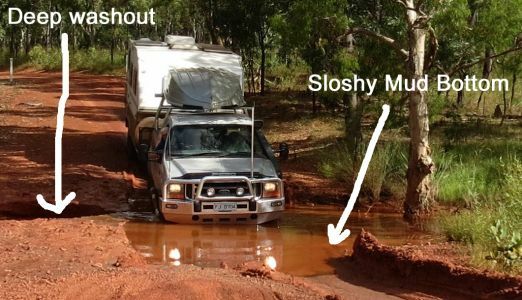 After Bramwell Junction you will likely find vehicles and camper trailers with broken bits on the side of the track with owners trying to do bush repairs. Because its only 200 kay to the Tip, travelers can smell the Tip and common sense go�s out the door and they start pushing their trucks harder. 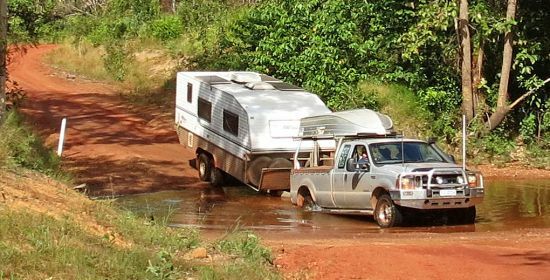 Jardine River Crossing will cost $145 return if towing anything from a 6x4 trailer to a 30 foot caravan. The entry & exit points to the ferry are rather steep, you may have to drive at an angle to board the ferry to avoid the drawbar scraping. Its only 45 kay to Bamaga from the Jardine. 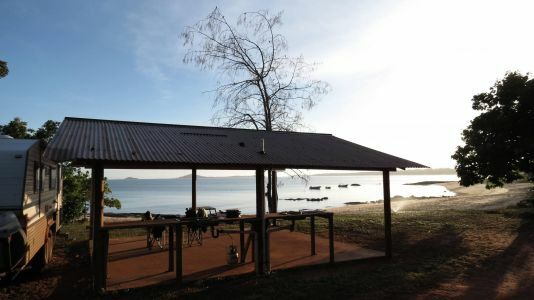 My suggestion is to spend the first couple of nights at Alau Beach Umagico (Old name was Umagico Caravan Park) It has new owners who are very friendly with cheap rates. Use this as a base to visit Bamaga/Seisia/Thursday Island/Mutte Heads/Aircraft wrecks etc. Regarding fuel at the top end. The cheapest place was Injinoo just 8k south of Bamaga where it was 10c/L cheaper than at Bamaga ($2.15/L v $2,29/L. Bamaga drop their prices by 10c/L on Thursdays as it is pension day. Every few day a local diver would bring his tinny onto the beach and sell fresh caught Painted Crayfish at reasonable (compared to city) prices. Slit them lengthwise, dress with a seasoned butter and grill on the Weber only just until the flesh turns opaque. Although the community is a bit ruff around the edges as you drive through it, its worth it down on the beach at the caravan park. Parking beside one of these shelters is the same price as on the grass. Shelter has concrete floor, Power, lights, water, s/s sink, plus a wooden bench. there are only two shelters, both right on the edge of the beach. Its not worth taking your van to the tip, mainly because of the parking arrangements. My suggestion would be to depart Umagico early, around 5am. You really need to get your van through the 7 km Lockerbie Scrub section before the 4x4 Tour Buses & 100�s of 4x4 drives start to head there. There is nowhere to pass another vehicle along this stretch of the Lockerbie Scrub. Then head to Sommerset Beach and camp there. You can use this area as a base camp to do the Tip, 5 Beaches Run & Lake Wicheura. 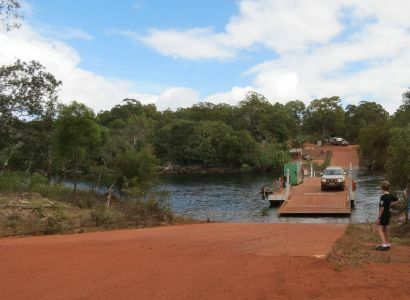 Sommerset is another free camp area that�s part of your Jardine River Ferry Fare. Its all written on the barge pass. But don't tell anybody otherwise there'll be no space left to camp next time. We had a chopper land on the beach one day. A bloke got out ran up to a 4x4 drive grabbed a 9kg gas bottle and the chopper took off again. Punsand Bay, is it worth going there? Well its expensive to camp there. You�ll pay an extra $15.00 a night for power. There are only a few powered sites that you�ll get a BT into. In the camp area there are far too many narrow tracks with too many overhanging trees. Stop in the car park and walk and check the sites before paying. This is another reason for getting up the tip early in the season. Don't forget it'll be still very damp getting in there after the wet season. 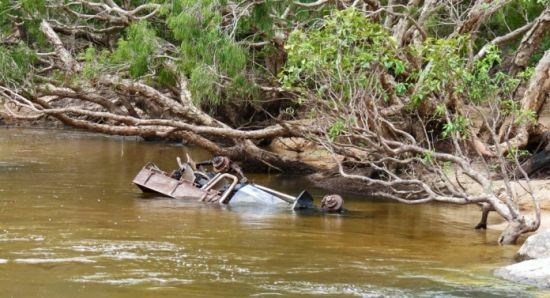 Be warned, when its time to head south again towards the end of the season you will not be the only vehicle departing the Tip and crossing the Jardine River. This line up was over 1 km long. Almost two hours waiting to cross the Jardine River. And they still kept coming and coming. Next time I would camp on the northern side at the ferry crossing the night before at the start of the line, so I can be the first ones across in the morning. John, I was a bit suss about the fuel at the servo your talking about, it didn't look like it had a real big turnover. I didn't want a batch of crook fuel. 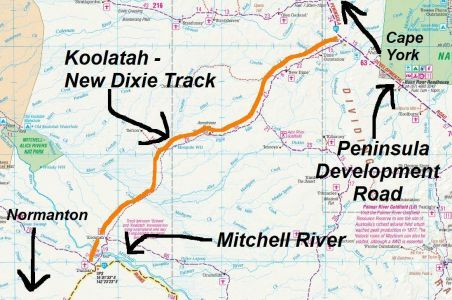 I know Bramwell Junction has a huge turnover because its the start of the overland telly track and hundreds & hundreds of fourbies fill up there. Yeah, I'd heard about the Crayfish Man. We were a bit early in the season for him. What about the young lady that runs the Umagico caravan park (Alua Beach) she does hamburgers on fridays nights and delivers then to your door. How good is that. On your way south take a different route home via the New Dixie Track. Turn right 24 kay after Musgrave Roadhouse. This is another track that should�nt be rushed. 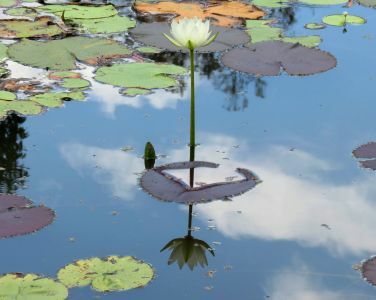 Stop and checkout the anthills, the billabongs & water lilies. Check your GPS Maps for locations, their just a short walking distance from the track. The topography changes so much, I really enjoyed doing this track. This is where SWMBO the 2ic, gets plenty of exercise, many gates to be opened & shut. Note the condition of the track at the northern end. Halfway along the conditions change to a two wheel track. We even had fire burning along the middle. Lots of these creek crossings, there no problem for the BT. 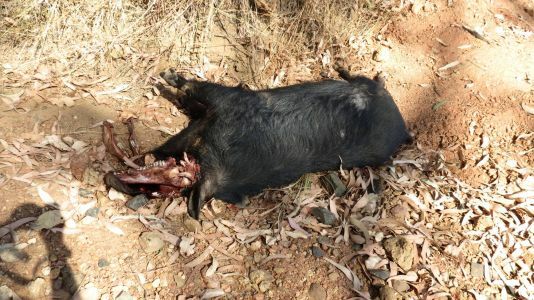 Between the Mitchell River and Normanton there is plenty of this stuff. So make sure all the windows in the BT are locked. Cape York is a place that should not be rushed, take your time & spend many months up there enjoying it. You may not get another chance to see it. On our next trip up the Cape in a couple of years, we'll be covering the Cape's East Coast. Excellent and informative post, thanks. Between the information provided by yourselves and others here our plans for The Tip trip are coming together. Looking forward to doing that Dixie Track as well. D&T, Mareeba is cheap to stay at. The Rodeo Grounds are just 4.5 kay from town and cost $17.00 a night for power, water & hot showers. Mareeba holds the second biggest Rodeo in Australia and if your camped there you get a huge discount to attend it. 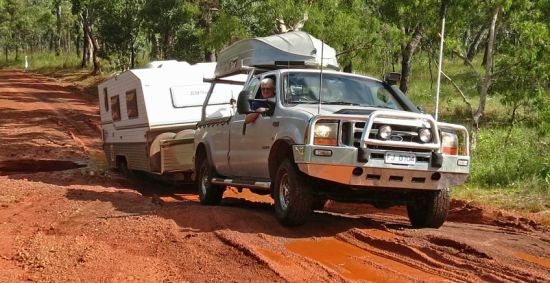 The Rodeo is in July and I suggest you arrive a couple of weeks prior as 200 - 300 caravans/motorhomes converge to camp there. There's also a very large sideshow setup just for that weekend. 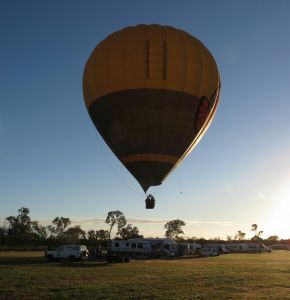 Mareeba is also the Hot Air Balloon capital of Australia and the majority of them land at the Rodeo Grounds. 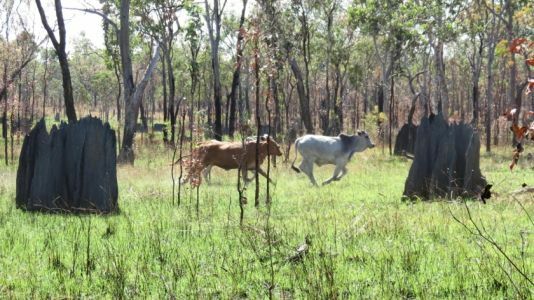 Mareeba is a friendly town and only 50 - 70 minute drive to Carins and a 30 minute drive to Atherton. 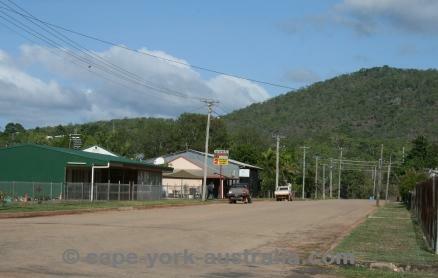 Its also the last major stockup town before heading up to Cape York. Despite what you hear about the shops up the tip, you can get just about anything you want at the top end. Umigico Store has about the best range and freshest fruit & vegies. Seisea has the best range of groceries. Just find out what days the resupply ship comes into Seisea Wharf and be in the shop the next morning about 10am to get the freshest stuff. There's also a large fishing store at New Marpoon to replace that fishing gear when you get broken off by a big Queenie. Thanks Devils, more useful info for the trip. Much appreciated. There is also a very pleasant well run park at Walkermin between Mareeba and Tolga. No formal parking in rows like tin soldiers. $22,00 per night powered. 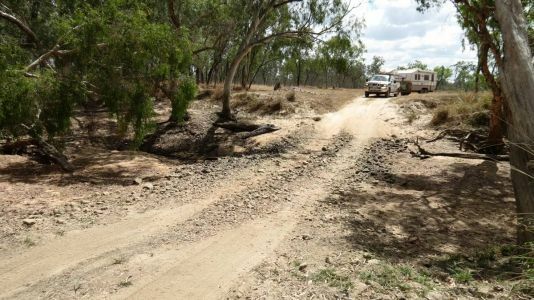 Rocky Creek is a free camp between Walkermin and Tolga - popular overnighter but can be noisy from traffic.